Robert Hunter has contributed to a number of Bob Dylan songs that have been released on Dylan albums. The first collaboration was in the late 1980's - around the time of or just following the Dylan / Dead tourin 1987. Later collaborations took place in the 2000's. This page summarises these collaborations and lists the songs involved. A separate page discusses the various connections between Bob Dylan and the Grateful Dead. Two of the songs, Silvio and Ugliest Girl In The World, on the Bob Dylan album Down In The Groove were co-written by Bob Dylan and Robert Hunter. Silvio which was released on a single as well as on the Down In The Groove album. Nine of the ten songs on Together Through Life are credited to Bob Dylan and Robert Hunter. 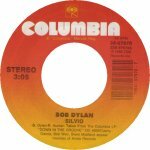 One songs on Tempest, Duquesne Whistle, is credited to Bob Dylan and Robert Hunter.